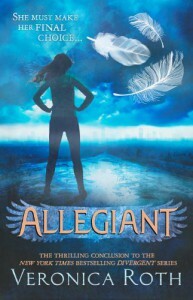 Allegiant (Divergent, #3) - Ana V.
Warning: this review WILL contain spoilers and I WILL NOT bother to hide them. If you're reading the review for the last book in the series, you are probably familiar with what has been happening and can handle information about the story. If you haven't, please note that I am not responsible for sudden fear, anxiety or anger directed towards the writer, myself or any God that you believe in. I am not responsible for your take on this! If you want to read more spoiler free reviews for this, you can check out my opinions for the first and second book, though they are pretty short and kind of meaningless, compared to the volume of the whole series. This will be more complete, though. Let's see, what can I start with? First of all, after going through all three parts of this, I still don't like Beatrice Prior. Her character seems to be incredibly shallow and unreal, and as I stated before, I will accept any blow to my fictional world except the one targeting the character. What's the point in having a perfectly built world if you're filling it with empty meat shells and give them a reckless, childish teenage girl for a saviour? Oh, wait, was that the purpose? Because if it was, you kind of managed to make me not like her, Roth. I've dealt with spineless characters before, and I've dealt with the spine..full? lot of them, but rarely do I get to see such a joke for a main lead. Tris seems to be smart but her decisions contradict this every single time. Of course, as the series comes to an end, Roth managed to fit in some smart moves and a general master plan, but you have to get to the last book and in its second half to find that, because for the first three quarters of the series all I wanted to do is bully Tris into erasing herself from the book. You'll see that I gave all three books of the series three stars, even though the first one is closer to a two, in my opinion. The main reason for that is the lame excuse for a lead personage. If, and I'm only talking possiblities here, if she would've been better written or better thought out, I think it could've won a 3.5 overall rating, with the best book being the one in the middle. If this series were a cardiogram, it would look something like the Summit logo, but with another little mountain in front of the big one. Because the second book is definitely the best one, as a complete composition, out of the three. Tris is still stupid and Tobias is still naive and they're both children, but at least other things happen that take your mind off of it. Now, in the third book, Roth pulled the "Twilight" trick. She started writing chapters from Four's point of view. So we would see how he looks at Tris and notices her bird-like figure and her petite frame and how her blond head seems to bounce around everywhere and happen to be empty at the same time, how she would have this look of harshness and bravery and readiness about her. Well... no. Not that. At the end, I understood why she did it, it's just an introduction for her in order to be able to write the epilogue and also to split the action in the book and cover more ground at the same time. But still, the first three or four chapters written like that were cheesy and frankly unnecessary. But, when I have to pick my favorite part of the book, the ending is by far it. In YA books, and in general in teen fiction, the authors are reluctant to killing off the lead. They usually torture one of it's friends or kill his/her best friends, and they certainly put the main character through so many challenges that you can't even remember them, but the golden rule is to never kill them. It wouldn't be right. They must prevail, they are the story's backbone, they represent an ideal, they stand up for the right values and killing them would also mean the bad guys win. You don't want that. So, by default, YA fiction is somehow built around the main character and the one thing you're absolutely sure of is that no matter what happens, they will live. It didn't happen like that here. And I liked it. A lot. Roth had the balls to take this fictional world's lead and kill her off, in about 20 lines. No more, no less. Not a very long death, not a very heroic one either, but she did die making a change. And I realized that what that meant was that the WORLD will prevail, not matter what. Not the human, the flesh and bone, the sick, the damaged, the undamaged, the genetically scrambled mess that a person is - but the world itself. That world will be there even after the person who kind of changed will be gone. And there are others who can also do what she did, who can continue to change and recreate and mingle and make things better. And that is beautiful. And more correct than believing in a flawed human, a mortal creature, even if it's a fictional character or a real world leader. So yeah, I really enjoyed the ending. The epilogue, not so much, but the fact that she dies suddenly made this whole story better. With that, I think I'm kind of done. The Divergent series is not the best one out there, but if you're a fan of this type of characters, you'll like it. I don't regret reading it, but I think there could have been ways Roth could've made this better, if she had paid more attention to her lead.